It’s no fun being in a car accident. Forgive us for sounding like Captain Obvious there, but it’s crucial for drivers to think about just how traumatic a traffic collision can be before one happens. After an accident, you usually don’t have time to sit around and recover; rather, you’ll have to stay calm and make a series of decisions on the spot. If you’re not prepared, it will likely be a confusing, even intimidating experience, especially when you add an inevitable adrenaline rush and potential injuries to the situation—and there can be real consequences if you don’t do the right thing. So we’re here to help. We’re going to break down the post-accident scenario into three simple steps for you to follow. As long as you stick to the script, we’re confident that you’ll pull through with all your bases covered. When the accident happens, remember that you’re not the only car on the road. Even if you’re not in a busy area, you never know when other cars are going to appear on the scene. So if your car is still drivable—and you’re still in a condition to drive it—the first thing to do is move the car off the road. Do not get out of your car while you’re still on the road and try to resolve the matter then and there, as that’s just another accident waiting to happen. 2. Collect and report the appropriate information. What do we mean by this? Well, first of all you need to assess the damage to both the cars involved and the people involved—and call 911 immediately if there are medical concerns, bearing in mind that injuries can be internal as well as external. 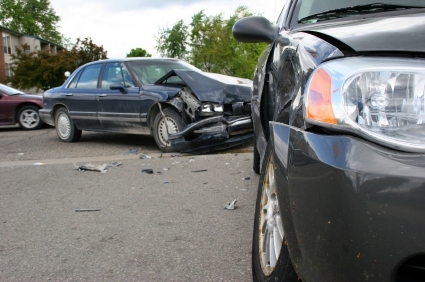 Occasionally collisions will result in no discernible damage, but if you have any reason to believe that damages were sustained, you’ll want to exchange insurance and contact information with the other involved parties. We also recommend taking note of as much information about the other vehicles as possible, including license plate numbers, make/model/color, and so on, unless those details are clearly marked on the insurance information you receive. This is a good time to pull out your camera phone too and take snaps of all the damage to the affected vehicles as well as the scene of the accident. You may need to defend your account of the accident at some point, so the more evidence you’ve got to support it, the better. If the damages are significant—i.e., if it was more than just a fender-bender—be sure to call the police as well, even if you’re not sure whether a report needs to be filed. When in doubt, let the authorities determine the proper procedure. 3. Notify your insurance company. Unless there really are no damages to report, you’ll want to let your insurance company know about the accident as soon as possible. Since you already took plenty of pictures and got the necessary detailed information, you’ll be able to quickly paint a picture of what happened. That’s it! If you follow these steps, we like your chances of emerging from the accident in the best possible position. Hopefully you’ll never need to do any of the above, but accidents do happen all the time. Remembering these basic guidelines can go a long way toward making your accident experience a smooth one.